For its 16th edition LOOP centres its focus on production and the relations between producers and products. This year’s Festival will reach more than sixty locations throughout the city, transforming Barcelona in a vibrant community of video art lovers. Variously conjugated as manufacture, fabrication, assembly, staging and performance, the word production hints at a myriad of scenarios that, to different extents, all imply an active process of creation and a co-dependent relationship between the producer and the product. Departing from the intrinsic meaning of the word’s etymology (from the Latin ‘producēre’, or ‘to bring forth’), this year’s edition of LOOP will revolve around two main questions that still hold true and acquire new meaning when translated into the moving image panorama: How do we produce? and How are we produced? Through a series of exhibitions, screenings, workshops and panel discussions, the program will ultimately centre on cogent issues related to the creation of artists’ films and videos, while exploring the many possible readings of production as a methodology, a performative act or the construction and representation of identity. The Serpentine Commissions, curated by Claude Adijl and presented by Hans Ulrich Obrist at Museu d’Art Contemporani de Barcelona, MACBA. Domestic and Urban Landscape, a film selection by In Between Art Film, curated by Paola Ugolini at the Fundació Suñol. Love the Daily Work, an exhibition of Merce Cunningham’s video works coinciding with the Centennial Celebration, curated by Xavier Acarín and Trevor Carlson at the Mies van der Rohe’s Barcelona Pavillion. Crossing Visions, a film selection by the Fonds d’art contemporain de la Ville de Genève (FMAC), at Museu Picasso. Col·lapse, a retrospective of Joan Morey’s works curated by Latitudes at Fabra i Coats. 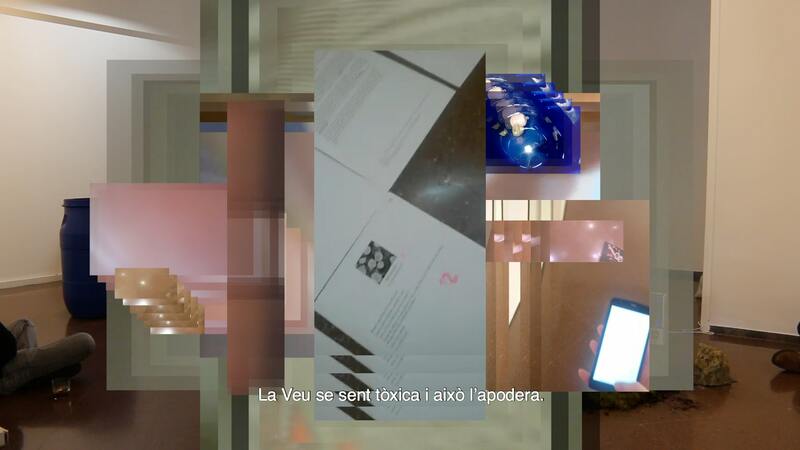 PRODUIR, PRODUIR, PRODUÏ(T), an exhibition of recent works by Serafín Àlvarez, Marion Balac, Paco Chanivet, Fito Conesa, Ariadna Guiteras, Mercedes Mangrané, Momu&Noes, Gabriel Pericàs, Sol Prado, Mario Santamaria and Helena Vinent. Curated by Xavier Acarín and Carolina Ciuti at Reial Cercle Artístic. In a Flickering Light, a performance by the artists’ duo Sander Breure and Witte van Hulzen, curated by Marta Ramos Yzquierdo at Museu d’Art Contemporani de Barcelona (MACBA) with the support of the Mondriaan Fonds and tegenboschvanvreden gallery, Amsterdam. Screening of Ascent, a presentation by Fiona Tan in collaboration with Casa Asia. Domestic and Urban Landscape, a program by In Between Art Film, curated by Paola Ugolini at Fundació Suñol. Núria Font: Cosmogony of Movement, an exhibition curated by Imma Prieto at Arts Santa Mónica. En la Ciudad, an exhibition curated by Albert Alcoz at Museu d’Història de Barcelona. Screening Performances, a project by Núria Gómez Gabriel along with Isaki Lacuesta, David G. Torres and Marc Caellas at La Seca-Espai Brossa. I Had Nowhere to Go, by Douglas Gordon curated by Pascale Cassagnau (CNAP, Paris) at Zumzeig. Giving Voices, an exhibition of works of Erkan Özgen organized by the Han Nefkens Foundation at la Fundació Antoni Tàpies. I tu què has fet per l’art?, an exhibition of works of Eugenio Ampudia at Tecla Sala. The Winner of the Co-Production Award 2018, artist María Ruido, will be premiering her project Estado de malestar at Arts Santa Mònica during LOOP Festival. This yearly joint co-production award is promoted by the Xarxa de Centres d’Arts Visuals of Catalonia, Arts Santa Mònica and LOOP, with the collaboration of other partners. LOOP is proud to announce the HAN NEFKENS FOUNDATION – LOOP VIDEO ART PRODUCTION AWARD 2018. This new collaboration with the Han Nefkens Foundation aims to increase contemporary artistic production in the field of video art and is directed at artists of Asian origin or nationality. The prize will be held in collaboration with the Fundació Joan Miró. With a focus on ecology, the selected videos to compete to the fourth edition of the LOOP DISCOVER AWARD, supported by Estrella Damm, will soon be released online. An international jury made by Lorena Alonso Muñoz (Art critic and writer), Jaap Guldemond (Director, EYE Filmmuseum, Amsterdam) and Hiuwai Chu (Curator, MACBA, Barcelona) will single out the 11 finalist works to be shown at the Fàbrica Estrella Damm, during the Festival.